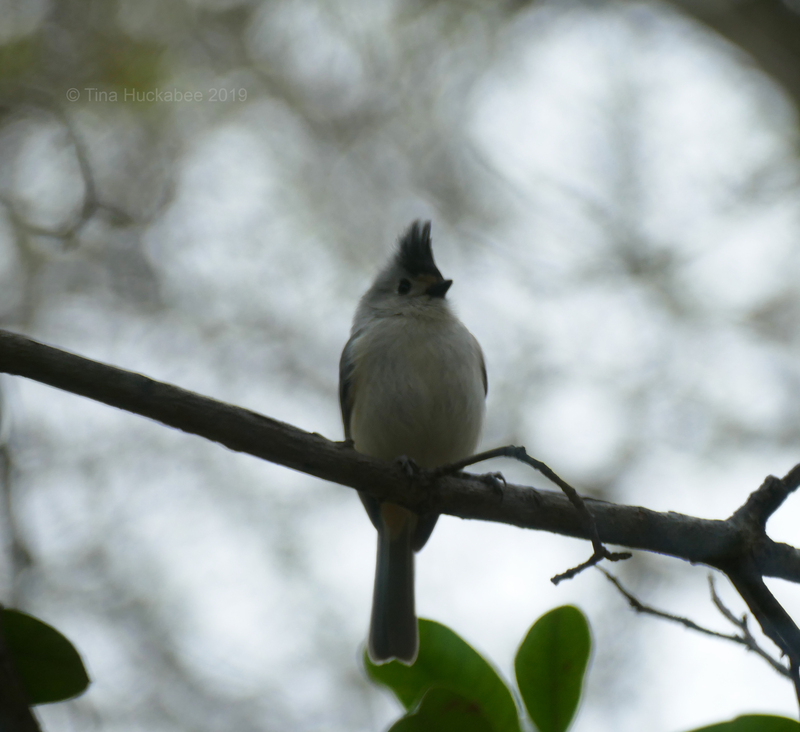 This entry was posted in Uncategorized and tagged Baeolophus atricristatus, Baeolophus bicolor, Black-crested Titmouse, Tufted Titmouse by Tina. Bookmark the permalink. GREAT POST! 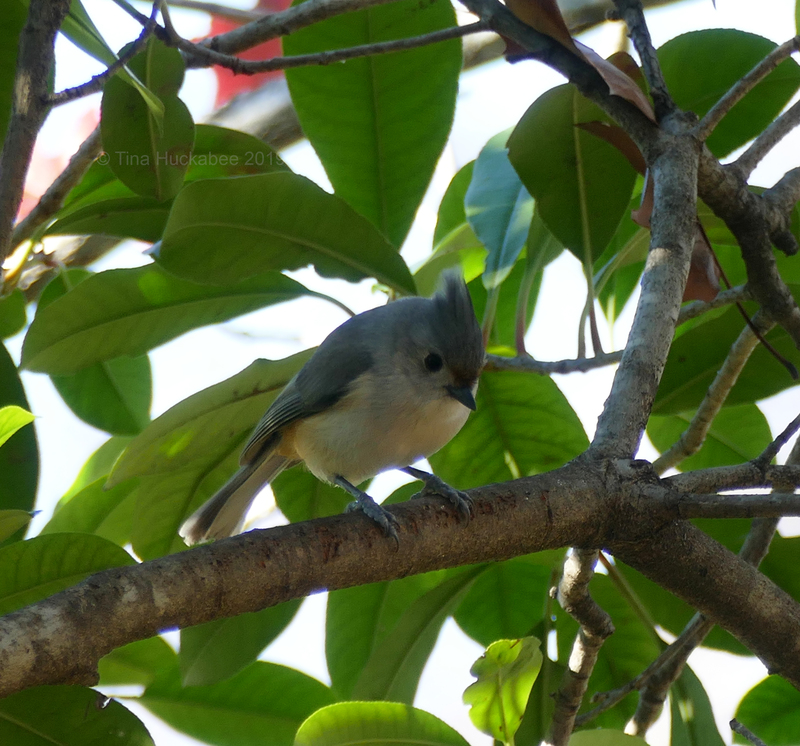 I haven’t seen any Tufted Titmouse for a while but I have heard them. They are a nice looking bird. Thanks for sharing. I agree, they are lovely. I usually hear them before I see them. Much like the Carolina Chickadees and Carolina Wrens–all little birds with big lungs! Such cuties! I’ve not seen any by me, but I think they are up here. I imagine they are, or at least the Tufted. Maybe they’re waiting for the warmer weather. 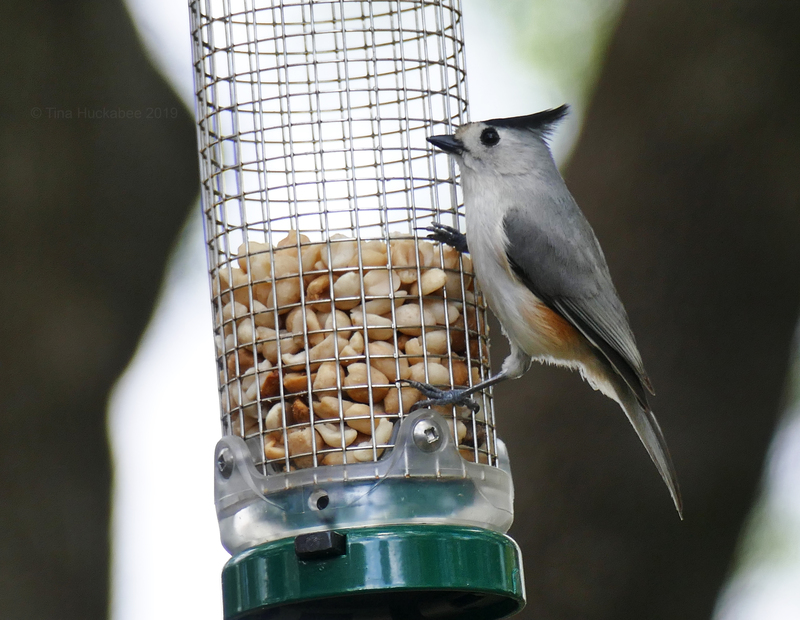 The titmice are some of our favorite local residents. They seem to hang out in a mixed mini-flock with a handful of chickadees, typically all showing up at the feeder here at once. A question about animal fur for nests? I’d abstained from putting our cat’s (considerable!) shed fur out for birds because of the systemic flea/tick medicine we give them. I read if you are dosing your pets their fur might hold some of the active ingredients (neurotoxins) and could pose a danger to small birds. Do you know if that is a necessary precaution? 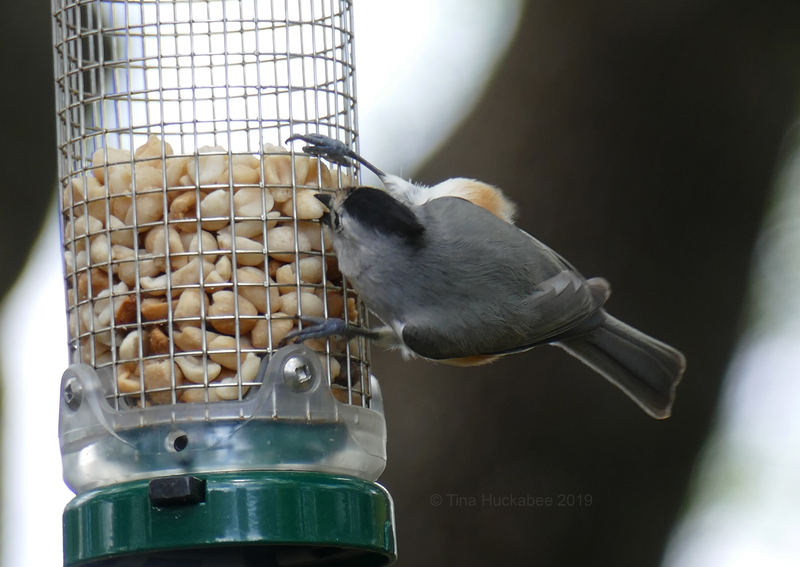 Yes, Chickadees and Titmice hang out together. Interestingly, I seem to only have one chickadee coming into my back garden and I haven’t heard the male’s signature territorial song around my house, though I hear it elsewhere in the ‘hood. Your question is an excellent one and I didn’t even think about it while I pondered the post. I seem to recall reading that it’s not a good idea to place “treated” fur, though I don’t remember where I read it. I don’t treat the cats–we just haven’t had a need for that, maybe they’re indoors just enough? I don’t know, but they haven’t had fleas or ticks–ever. But I did treat my Asher dog with a heartworm/flea/tick neck med and I sometimes put his fur out. I only put the fur out in early spring; I’ve never actually seen any birds take fur, but this spring, the fur looked like it had been messed with, so maybe someone snatched some?? When I cleaned out the titmice nest last spring, the fur that was in there looked like opossum fur to me and that would make sense. We have a few around. 🙂 There was also pollen/catkins/ soft leaves. They’re resourceful little things. You got some impressive shots, considering they never hold still. I need to look carefully and see which kind I have. I think Tufted. I did not know about the animal fur. That practice seems difficult. They’re hard to catch, but I think chickadees are even more difficult. Hummingbirds are the hardest!! 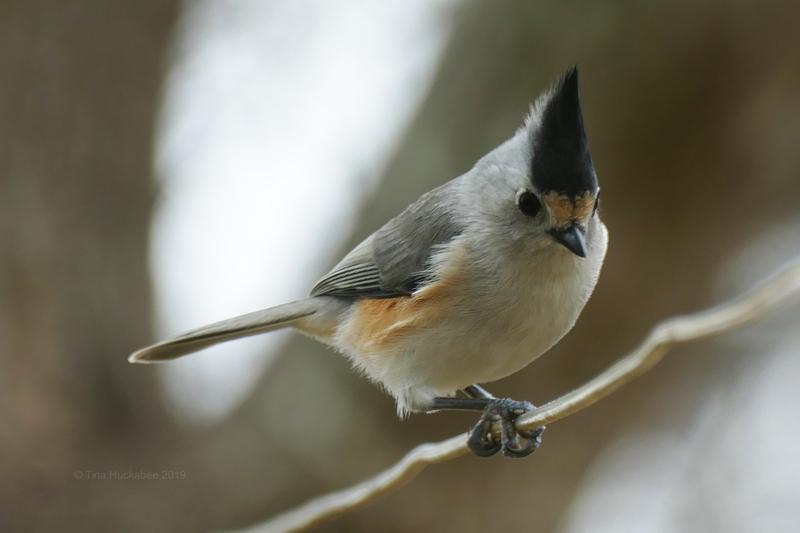 I had no idea there was a black-crested titmouse. 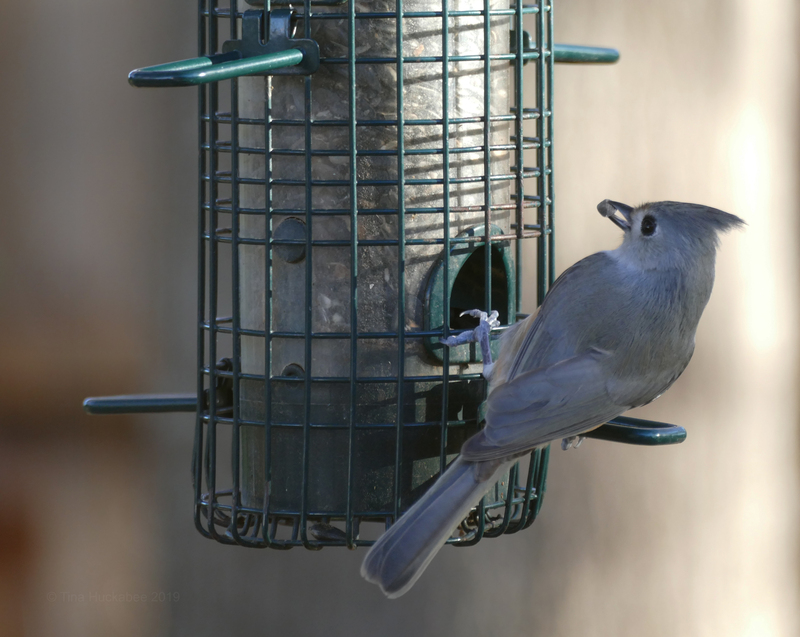 I’ve only ever seen the tufted titmice, and they’re darling birds. Your photos are wonderful. Both species always seem to me to have such a startled expression on their faces. I saw a video years ago of a bluejay pulling hair from a pet dog. Whether that’s common behavior for bluejays, I don’t know, but it was hilarious to watch. That’s interesting about the blue jays; I guess stealing fur is more widespread than I knew. Bet that fur is nice for the chicks! Don’t think I’ve ever noticed these kinds of birds, but maybe now I will. I’m sure you’ve heard them, they’re pretty common in this area. That could well be. We often hear birds that we can’t see. 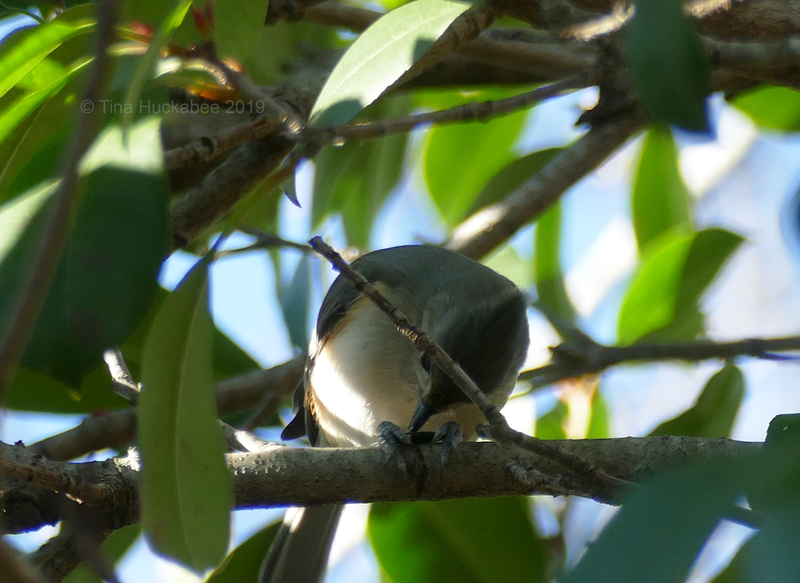 Click on the Black Titmouse link and go to the sound–I’ll bet you’ll recognize their callse/songs. Adorable. I wish we could import some of these little darlings. Haha–I don’t think I’d want to part with any. How about some starlings or house sparrows, I have plenty to share. Well starlings seem to have disappeared from my garden so I wouldn’t mind a few. I have plenty of sparrows though. We all have plenty of sparrows. That is a neat little bird! It really is–so lucky to have them around. I just saw an update from the Wildflower Center — Athena the owl has a new baby! Yes! I got the same update! I was there a couple of times in the last month and Anthena was dutifully sitting. Owlets! Yay! Very cute! I’d have guessed female to the male for the tufted titmouse and probably not looked further, so nice research on your part and a tick for new visitor. I put out Sadie’s fur for nesting material (I could probably supply the neighbourhood in all honesty), but I’ve never seen any taken. That’s funny about Sadie providing so much, but I know how that is! 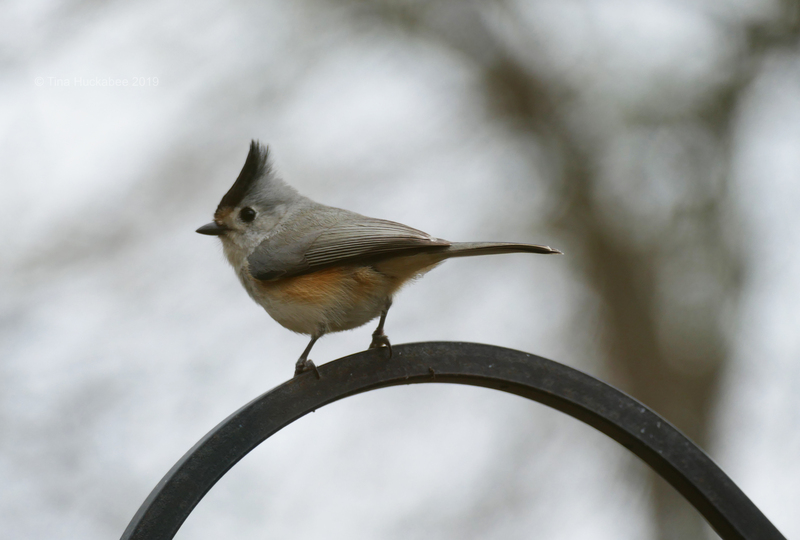 As for the the titmouse, I’ve had them in my garden for years, and it dawned on me that the female was difffernt. Added to that, I’m on Facebook’s Birds of Texas group (birders are…obsessive) and have learned so much! 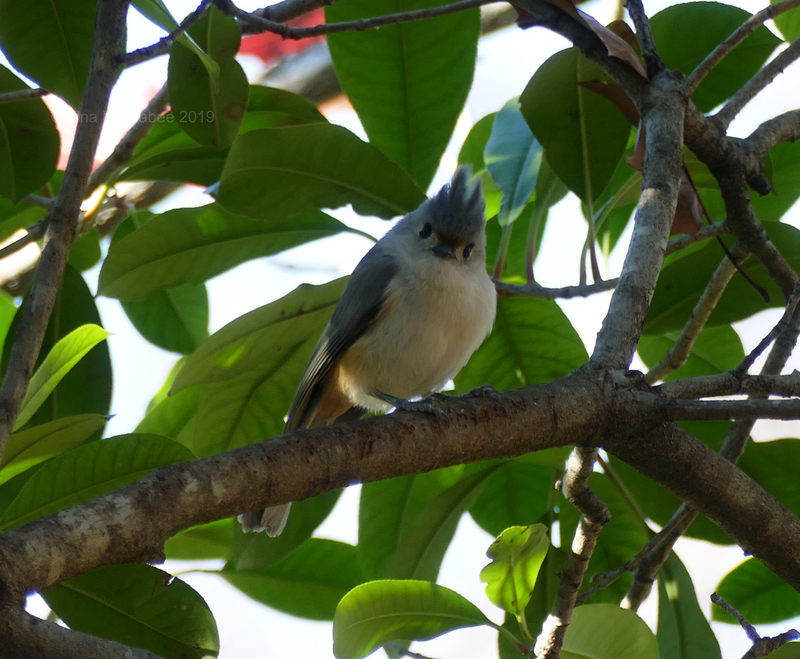 Others have noted the hybrid titmouse and it flinally rang the bird bell for me. Cute! I never see them in my garden. No, I don’t think the Tufted make it your area. But I’m sure you have other cuties! I don’t normally stop for birds, but that dude really is cute. He looks familiar too, but I don’t know why. The species that is native here looks nothing like that. If there were any of a similar species in Oklahoma in winter, I was not looking for them. 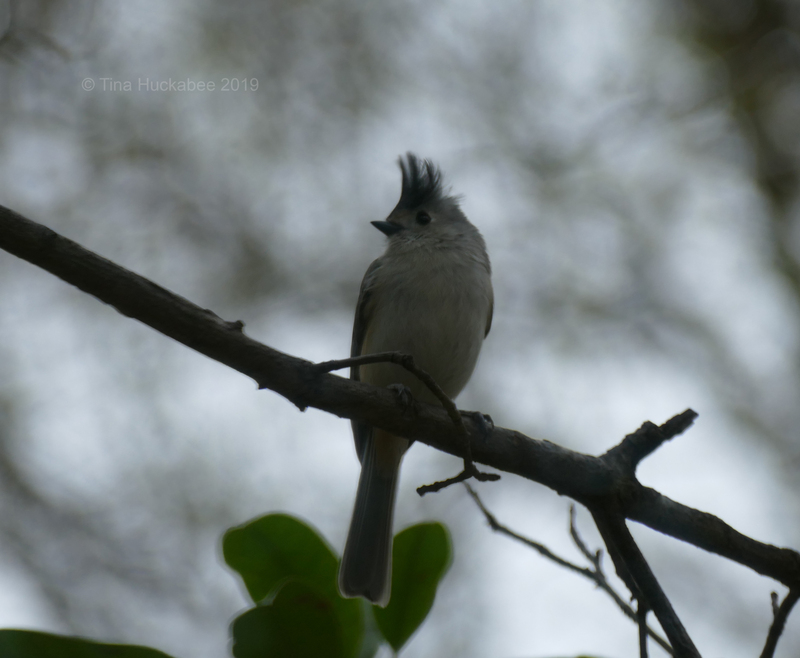 I noticed that the Tufted titmouse does live in most of Oklahoma–maybe you’ve seen or heard them when you lived there. Would they have been gone in winter? I happen to remember a few others just because they were so unfamiliar. Several species seemed to be there in winter. I saw the only cardinal that I have ever seen while there. It was crazy red! The weirdest and yet most familiar though were seagulls. That was the farthest I had ever been from an ocean, and there were seagulls; and they looked no different from those here. I know that those on the coast of Texas are different, but I could not see the differences. From the map I saw on the Cornell site, it looks like they live in Oklahoma year round, except for a sliver in the western part of the state. Cardinals are very, very red! And yes, seagulls do fly long distances, I think. I can’t identify many birds but these little ones have been bouncing off the windows at work (eating silk worms, I theorized.) I don’t know where their name came from when it popped into my head, but there you have it. I imagine they’re gobbling up all sorts of wormies–they have hungry chicks to feed. I read once that chickadees feed about 5000 caterpillar to their babies, I imagine the same, or similar, is true for titmice.